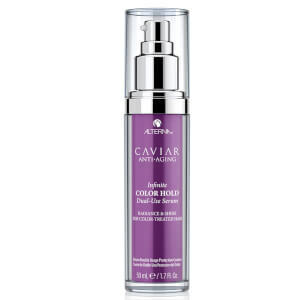 Alterna's Caviar Repair Shampoo and Infinite Color Hold Vibrancy Serum have been paired to help strengthen and repair your tresses while improving shine and colour. 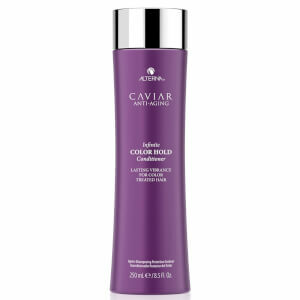 A restorative, sulphate-free shampoo that helps to fortify and reinforce tresses. Formulated with Caviar and strand-building proteins that mimic hair's natural ceramides, the shampoo helps to repair to promote improved strength, frizz control, softness and shine. Shampoo: Massaje o produto no cabelo húmido e enxague bem. 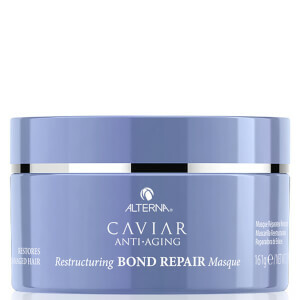 Para ótimos resultados, utilize em seguida o Condicionador Caviar Instant Recovery Repair.